Otter Creek combines relaxing golf with a beautiful setting and tremendous facilitates. 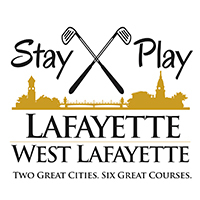 We have partnered with several area hotels to provide outstanding Stay & Play packages. We are also able to host golf outings, wedding receptions, retirement parties, birthday parties and all other business/social functions. Our Pro Shop is fully stocked with the most up-to-date equipment and apparel, at the most competitive prices around. Any way you look at it, Otter Creek is your destination for a great golfing experience. I-65 South to Exit 76 A (US 31 South). Take US 31 South into Columbus to 25th Street. Turn Left onto 25th Street. Follow 25th Street approximately 5 miles out of town. Turn Right onto County Road 650 E.
Turn Right at first stop sign, golf course is first entrance on your right. I-65 North to Exit 50A (Seymour / North Vernon). After Exiting I-65 turn left at the second stoplight - US 31N. Travel north on US 31 for 18 miles. Turn right on county road 50 north - course is at the end of 50 north (approximately 5 miles). Take I- 74 West to Exit # 134A ( to Columbus). Take State Road 46 West for 18 miles, to a flasing light at the intersection of State Road 9. Drive straight through the intersection, turn Left on 650 E, 1 mile west of intersection. Clubhouse is located on the south side of the course. We have a number of memberships and passes available so we can suit anyones need!!! Please call the golf shop for more information!!! 250, 200, 150, 100 Yardage Markers, Sprinkler Heads Marked, Cart path yardage markers as well. Contact Otter Creek Golf Course at 812-579-5227 for more information and details on holding a golf outing at the course. Contact Otter Creek Golf Course at 812-579-5227. Contact Otter Creek Golf Course at 812-579-5227 for onsite or nearby dining options. This profile was last updated on 11/12/2018 and has been viewed 26,607 times.